So I picked up this GS550L over the weekend. My first bike was a GS450 so I've always had a soft spot for these bikes. The 550 is my first inline four that I'll be working on. 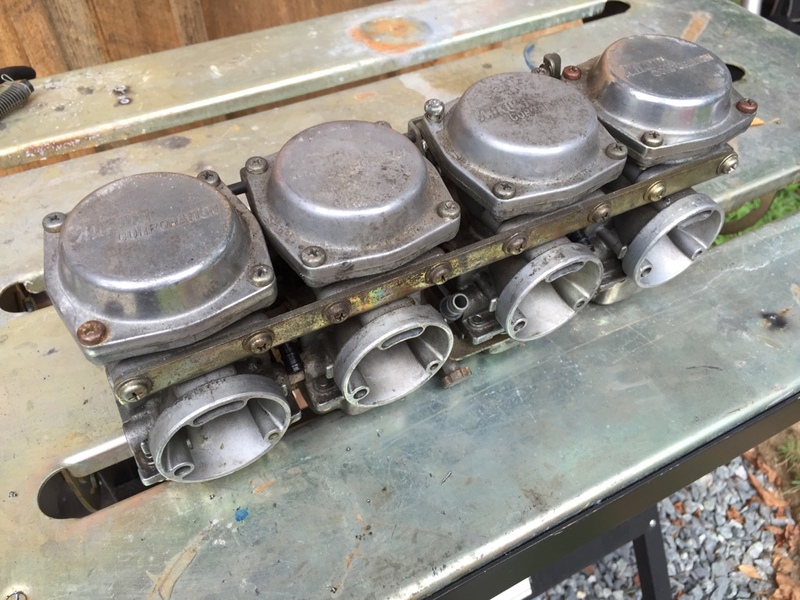 This project will be a distraction from my CB360 cafe build. I'm planning on leaving this bike 95% stock. I do want to replace the seat with something a bit more low profile, and some PO along the line had put some super bike style handlebars on, which I kinda dig the look and feel of. The bike currently isn't running, the PO had it fired up using starter fluid (yikes), which leads me to believe I just need to give the mikunis a good bath and cleaning and we should have a runner. It definitely needs some cosmetic cleanup, the front forks are squishy as a sponge, so I'll look into that soon. The goal is to have her on the road for the end of this rising season, get her mechanically sound and then over the winter start looking into the cosmetics. Re: 82 GS550L - Resto Mod? From what I can see, the PO put on a new RR, new battery, and cleaned up the exhaust (thanks guy). Inside of the tank is pretty clean, a bit of rust but pretty normal for a 30 year old bike. Probably run it with a filter for now and line it over the winter with my leftover POR15. All the chrome fenders are in great shape. Paint on the tank and side covers is pretty bad, will definitely get a repaint. I'll probably end up hitting eBay to replace the Suzuki badges on the tank. First on the line is to grab a factory service manual and learn up on the beast. Subscribing Always nice to see another Suzuki build. Pulled the carbs. 1-2 were pretty caked up from sitting on the kickstand with junk fuel as expected. Got em soaking and a gasket set on the way. Noticed there's an engine mounting bolt missing, I THINK it's one that goes all the way through. I'll get a pic after work. Gonna have to find something to stick in there. Got a broken throttle cable, ordering up some rubber and we should be rolling. Everything came pretty clean. Float needle springs all working. 1 & 2 were a bit sticky but oiled em up and they're moving freely. Choke plate and throttle assemblies oiled up. Waiting on a gasket kit from eBay. Any of you GS guys have tank emblems lying around? Mine were gone when i bought the bike. Just stopping by to say I'm in and get it bookmarked. Waiting to see how true you stay to this comment. I'm planning on leaving this bike 95% stock. I have a 78 gs550 project in the works. It is not stock. Will be interesting to compare the builds in the final stages! 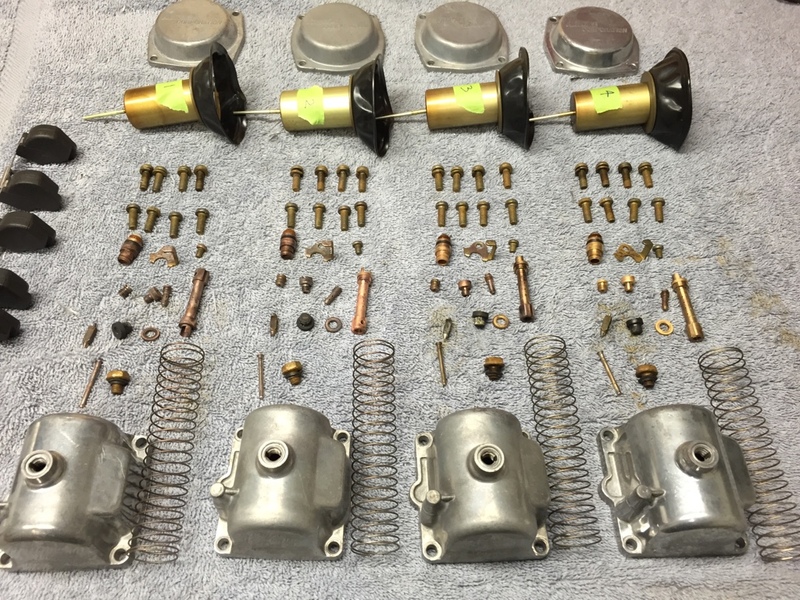 I have quite a few stock bits from my build, if you or anyone else needs anything. Entire top end and carbs are for sale. Round slides on this model. Just stopping by to say I'm in and get it bookmarked. Waiting to see how true you stay to this comment. I have a 78 gs550 project in the works. It is not stock. Will be interesting to compare the builds in the final stages! either way rad project and im hoping it turns out the way it seems like its going to so far. 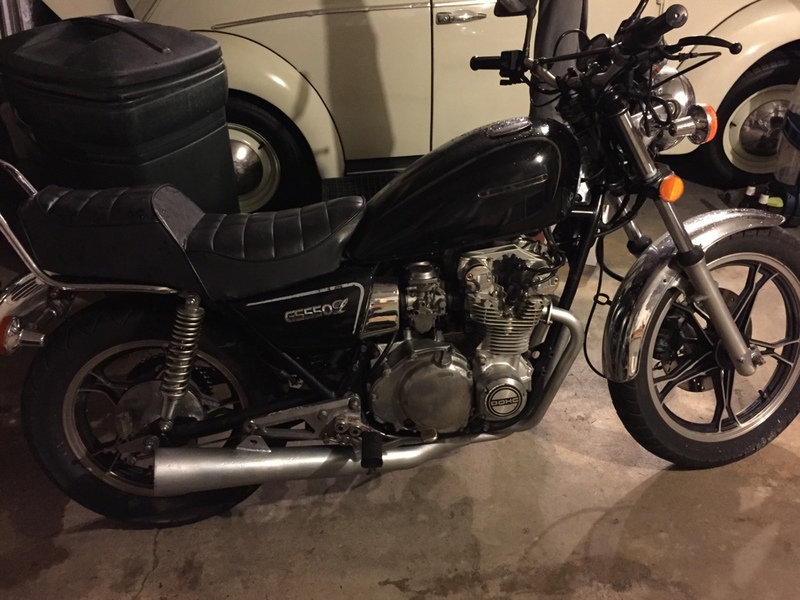 82 GS550L - Resto Mod? Also, the fuel line is a PAIN to get in while the carbs are on the bike. Note to self, install fuel line first. So I tried to fire her up running off the bottle but no luck, I think it's just the throttle cable since the plates are fully closed when it's not installed.